Rubenerd: Pretend You’re At a Malaysian WiFi Hotspot! Pretend You’re At a Malaysian WiFi Hotspot! I use the wireless network at the Coffee Bean and Tea Leaf at KLCC (Kuala Lumpur, Malaysia) quite regularly while sipping away at the greatest beverage in the universe (I'll give you three guesses, it's not tea, and the last two guesses don't count). I came home though and when I was looking through my browser history for… um… let's call it a page on how to be a better person… yeah that works… and I found the address of the login page that the browser on this machine automatically comes up with when you connect to the wireless network. I clicked on it and you can still access it! So if you want to pretend you're in a Malaysian WiFi hotspot, get yourself a nice tall cup of coffee or (teh tarik works too! 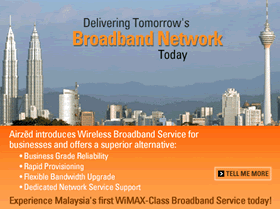 ), change your desktop to a picture of Taman KLCC, and surf over to the AirZed wireless page! This service brought to you by Rubenerd Ministry of Pretending You're Somewhere Else, not affiliated with the Rubenerd Ministry of Broken Power Cables or the Ministry of Silly Walks.